Have dupes gone too far? There has been quite a bit of controversy recently regarding fast beauty brands dupes especially Makeup Revolution (TAM Beauty). If you haven't read Beauty By The Bunny's blog post, I would recommend a read as it definitely started a debate, just look at the comments at the bottom! The argument does seem very split, some people believe that fast beauty brands copying higher end brands products is a huge problem and demoralising for the brand, whereas on the other hand, lots of other people are disagreeing and saying if it wasn't for these dupes they wouldn't have access to some great products. Now I'm in two minds and can see it from both perspectives but I do think I'm leaning more to the 'wrong' side and am agreeing with Angela from Beauty By The Bunny. As I said, make sure you give her post a read as well as she has done a lot of research and has even got some quotes to support her argument. Hear me out, I have previously brought products from Makeup Revolution and probably still will. When I first set across blogging I did a haul with dupes for the Too Faced Sweet Heart blushers and Chocolate Bar palette. Hand on heart I can honestly say I enjoyed using those products and do still use them. The reason I initially bought them though was because I had seen swatches and reviews on how good they were and then when I realised it was a dupe I guess it did encourage me to buy it more. Although I enjoyed those products I have also brought some of their other products and I've thought they were a waste of money, it's just a bit hit and miss like most brands. My makeup is a stash of high-end and drugstore products and I tend to buy what's right for me and what I like. If that's something from Makeup Revolution or say MAC then so be it! 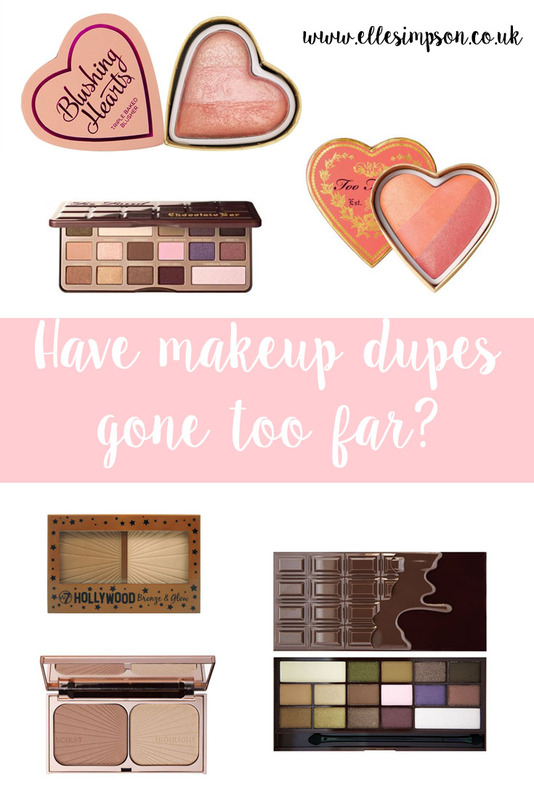 I love a good dupe, who doesn't?! But I love dupes for the fact that the product is the same colour/quality/pigment as the other product. I do not care for dupes that are only based on packaging and names as there's no substance to it, and this is where I think brands like TAM Beauty and W7 are going wrong. There is no doubt they do some great products but there are other times where they just push too much out that you do have to start questioning the quality. In Beauty By The Bunny's blog post you will see that she got a quote off Adam Minto himself saying that they've made 3,000 products in 3 years, now that's a lot. High-end and even drug store brands don't do this as they put a lot of thought into the product hence why you pay the price, but TAM Beauty and W7 are both delivering for the customer demand. Pictures used are from the brand's official website. Overall I think there's no harm in good quality dupes but I do feel that where they copy the whole thing from the packaging, shade's and names I think is a step too far. What's your opinion on this?